Sinebrychoff | Beer Apprentice - Craft Beer News, Reviews, Interviews and Info. Today, I have a beer in my possession that I’m a little skeptical about. It’s called the Sinebrychoff Porter, which is brewed by Oy Sinebrychoff Ab Brewery in Kerava, Finland. I don’t recall ever having a beer from Finland, much less this brewery, so I have no idea what to expect. A rather lengthy description of the Porter is on the website, sinebrychoff.fi, but I’m only going to print a small excerpt. 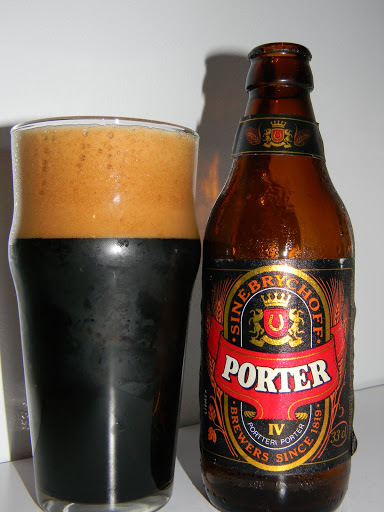 Sinebrychoff Porter is a top-fermented dark, almost black, unfiltered beer whose aromas convey a malty toastiness. The four different malts – pilsner, Munich, brown and caramel – used in its production give the beer its characteristic aromas: toastiness, chocolate, coffee and liquorice. Porter is strongly hopped with Saazer and bitter hops. Well…. I’m pretty picky about my Porters so….. This beer comes packaged in an 11.2 oz. bottle and has an ABV of 7.2%. The pour on the Sinebrychoff Porter was a very dark brown to black color with minimal ruby highlights around the edges. A dark tan head was formed from an easy pour. It had great size and very good retention. It had a soapy, milkshake kind of look with both large and small bubbles mixed together. After it settled a bit I could see that the lacing was going to be worthwhile also. Well, we are starting off well. With the first sip, I immediately received plentiful amounts of the dark fruit. I got more fruit than chocolate actually. It’s very rich and sweet with a meek smokiness. A minute alcohol flavoring was there, but it sat right in the middle the way it should. It’s a touch toasty and only a faint bitterness was observed. The coffee aspects were noticed again, however they seemed to be a bit restrained. Right at the very end I started to detect a Melba toast type of flavor. Hmm. Never encountered that before. The overall taste was good, however I didn’t think it was balanced as well as some of the other Porters I’ve had. The coffee distinction was a tad too relaxed in my opinion. The mouthfeel was medium to almost thin actually. It wasn’t as dry as I had anticipated either. It was smooth, but it didn’t have very much creaminess to the texture. A decent amount of flavor was left behind for me to enjoy though. Overall, this is a very good Porter. I was pleasantly surprised with it. The aroma was excellent and the taste wasn’t bad either. It just lacked a little in the mouthfeel department. This beer was fairly easy to drink at 7.2% and the light mouthfeel did not allow this brew to be overly filling or heavy on the stomach. I could have another one with ease. I’m going to have to seek out a few more products from Sinebrychoff and see how they stack up to their Porter. I’m not sure how available this brewer’s beers are, so if you see one, pick it up and give it a go.